The more my body and coloring change the more obvious it becomes that style rules must also change. 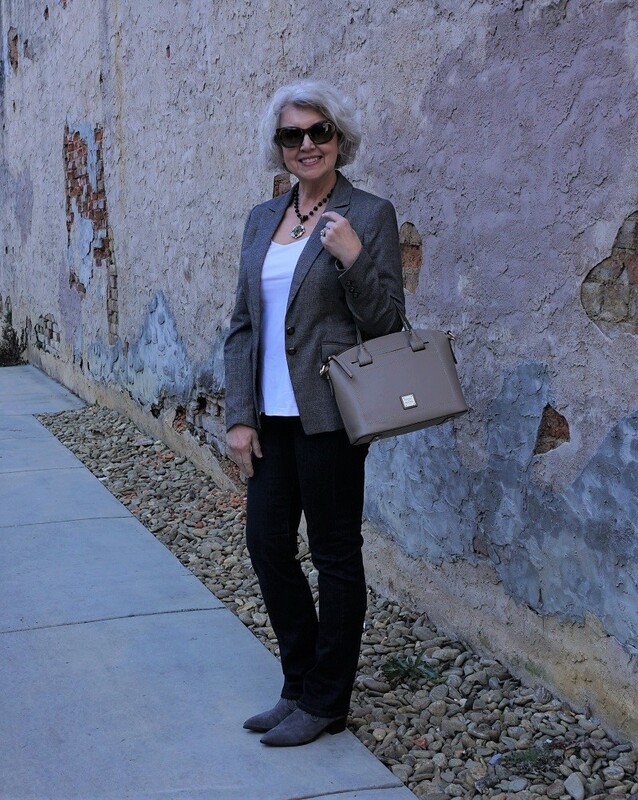 Silver hair and a softer contrast in my skin and eye color require less standalone black and white clothing. I need a little color from a silk scarf or bright lipstick to keep from looking a bit drab. The best thing about having my picture made so often, is that it keeps me on my toes. I can see right away when five pounds have crept back and when my styling game is slipping. One of my pet peeves is pants that are too long and then bunch on the top of the shoe. It ruins the silhouette. If there are rules about such things, it is that the slimmer the pants, the shorter they should be on the ankle. The very comfortable and flattering Liverpool Co. jeans are now at Yonnie’s Alterations getting hemmed. An inch too much fabric makes a difference. When my waistline vanishes beneath a boxy top, it makes my legs look shorter, and my torso look larger. Pushing up the sleeves helps me to appear to be taller and thinner. The necklace is old from French Kande. Newer versions are here. The white tank is from Chico’s here. The gray plaid jacket is old from White House|Black Market, similar here. 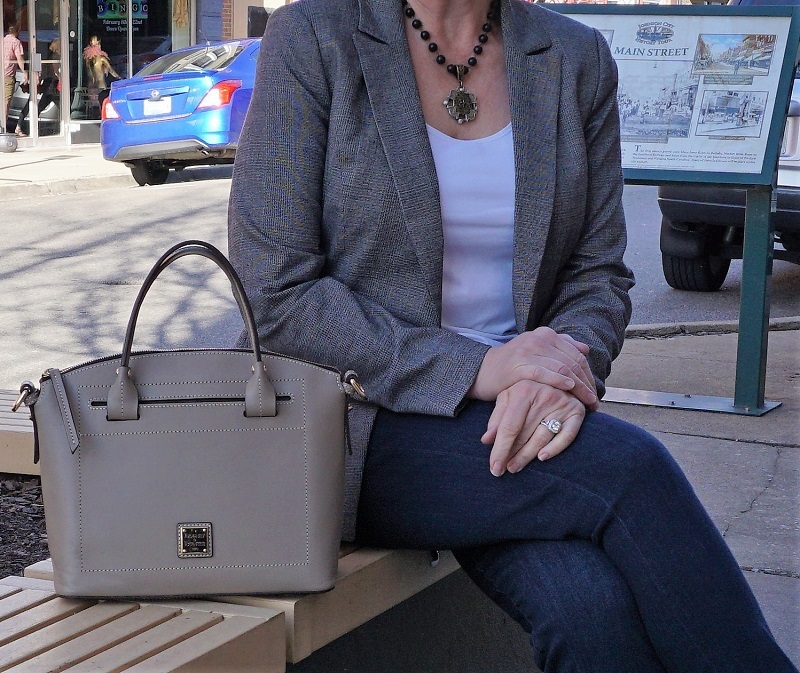 The light taupe bag is by Dooney & Bourke here. The gray suede shoes are old by Marc Fischer. Similar here. Those new favorite jeans are from Liverpool Jeans Co. here. And the ring on your left hand? Mr. Mickey purchased it for me while we were shopping a the boutique “Spoiled Rotton” in Highlands, North Carolina on a weekend getaway. I prefer fashion jewelry that mimics fine jewelry. I need help please resetting password as the one this site gave me doesn’t work either and I would like to buy a scarf. Thanks. Please check your emails. I need to enter your mailing address first before you can shop. I have followed you for a very long time and have used many MANY of your styling tips to add to my wardrobe. Thank you for sharing all that you do!! I have learned that even with fashion, it’s “all in the details”! I love wearing scarves to accentuate an outfit and do so often! Thank you for the suggestions and instructions on how best to wear them! 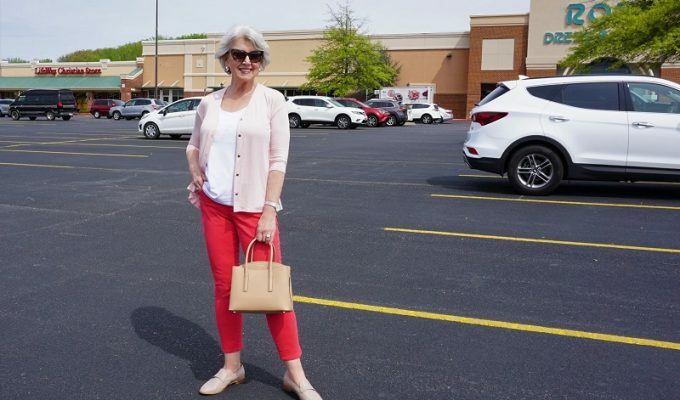 I love the Dooney & Bourke handbag you styled in the photos with this post and have noticed you using it other times as well! The link you shared above is for the Mini but I think the handbag pictured with you is larger than that? My budget doesn’t allow for some of the items you share (the handbag is one!) but I definitely use your style as a guide and find similar items that do fit within my budget. Thank you, again, for sharing with us! We all appreciate your time and your expertise! Thank you for following along and for letting me know I shared the wrong link. I’ll correct that right away. Sometimes the reason older women need to shorten the pants that were fine last year is that we are shrinking. At least that’s the case with me. I’ve shrunk almost two inches and had to have my pants, which had been shortened when I bought them, reshortened. It sneaks up on you. My coloring is very similar. My hair a little whiter so I now wear a lot of silver and gray clothing. Shall I get on my bandwagon, ladies? Ask your doctor to run serum calcium and parathyroid hormone tests. These simple blood tests together can determine if calcium is leaching out of your bones, possibly leading to osteoporosis. There are other causes, but this one is often missed. The condition is called “hyperparathyroidism”. Hi Susan, you are so right! But for me it’s three pounds because I’m only 5’1″. What do you think of three quarter sleeves? For a petite, they expand my options because a size small non petite top won’t have sloppy sleeves that are too long. I have moved away from so many great seamstresses! I have to find one yet again. But I have also learned to buy carefully so that I don’t need a garment entirely reconstructed! I once took a chance on a Carlisle sheath in a small but the armholes, bust darts and waist were below mine. It cost a fortune to have it altered and she did not even get it done in time for my event. I totally agree with you, concerning the length of pants. I am not in a position to have a pair for each height of shoes. But my biggest problem, right now, is trying to decide the length of pants I should have when wearing socks and flats. In our cooler months, socks are a must! If my pants are hemmed to ankle length, they look tooo short for flats and socks. But….. I donot like pants that are baggy! I hope you have some suggestions for me. I agree with you about not wearing socks that show beneath ankle length pants. I wear socks with pants that touch the top of my foot and shoes that cover the top of the foot. Ballet flats are meant to be worn with ankle pants and bare legs, never with socks (as the opposite example). Something that I do is to buy a tall and hem them if the pant leg is too tight in the calf area with the regular length. The rise is the same on a tall, but the leg being longer causes the taper to be slightly wider at the calf. Have you ever tried this? That’s a great idea! Since I have to hem all my pants anyway, I might as well make room for my ample calves. Thank you! Hi Susan: I love a lot of your ideas and you have put into words so many style concepts I followed but just because they kind of felt right. Now I can share with others because I understand the why behind them. 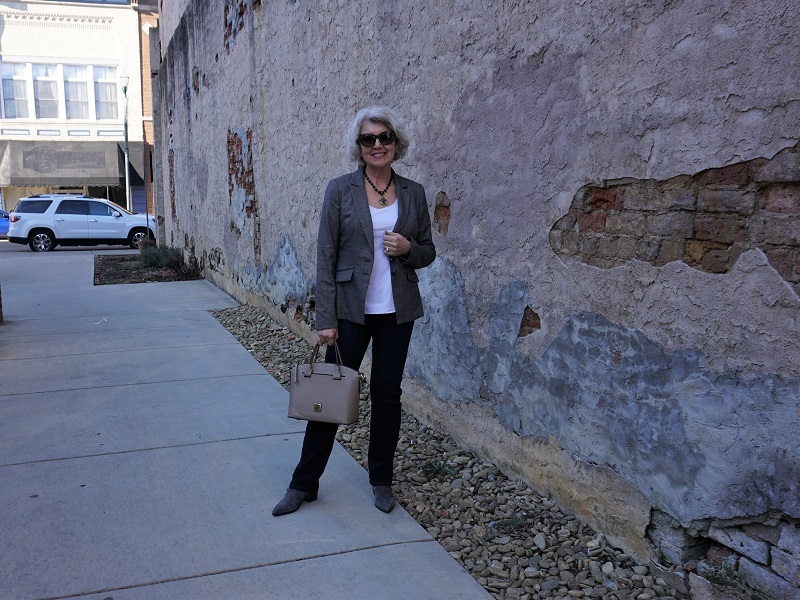 As for the pants – I really like the look when you wear longer pants like in this post. I think they make your legs look longer and therefore you have a long and lean silhouette. Very flattering! Susan, this fashion dysfunctional is trying to come up to speed on what to wear for her body type and what colors suit her best. There are several trends out there now that I don’t know when to do and when not to do. 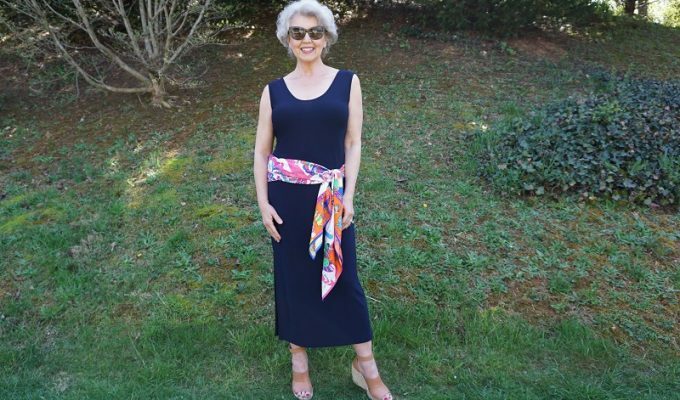 For instance, when I wear a short blazer over a top, blouse or tank, when do I leave it out or when do I tuck it in and if I tuck in do I use a belt. Also, there is that half tuck that looks so messy to me. Thanks for any input you can provide. 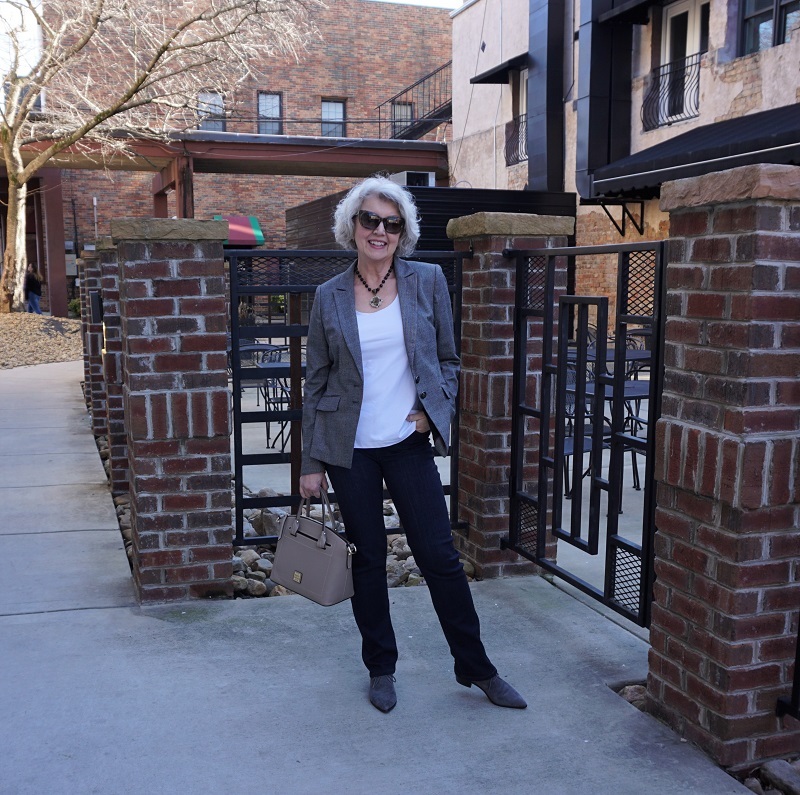 I am 5’7″ and wear a size 10 and at 75 years old don’t follow trends. Your website has been a big help to me though our coloring is different. 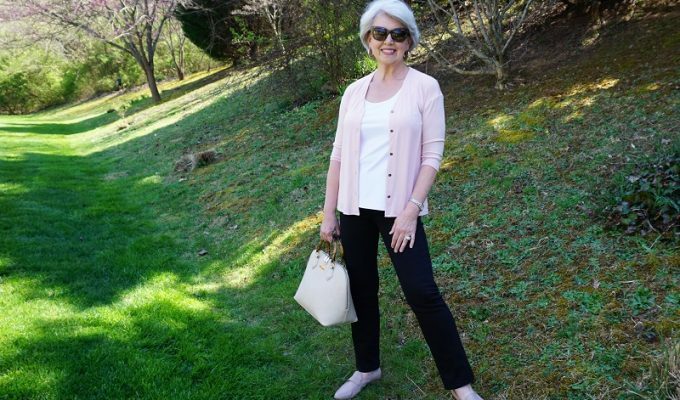 I rarely acknowledge a trend, but I embrace the look of a short jacket over a longer top because it is a flattering look for my thick high waistline. 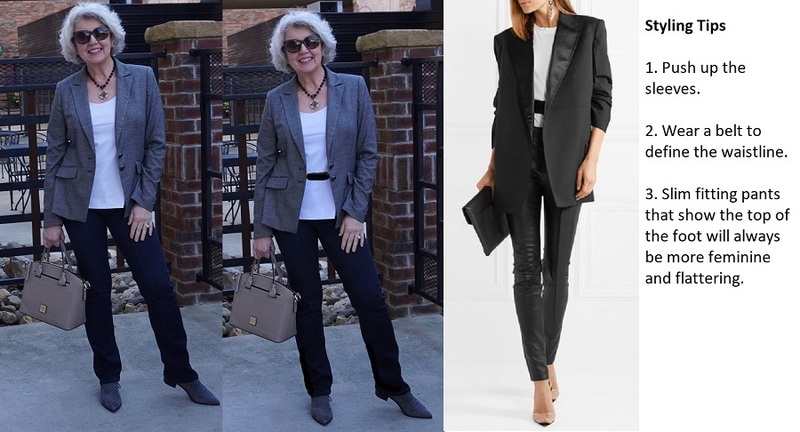 If I wear a long blazer, I might tuck in my shirt and wear a belt, or I might wear a belt over the top just to suggest where the waistline is. The most important thing is to wear what feels comfortable to you and what flatters your shape. I’ve tried and tried to incorporate a belt, even on the outside of my shirts but my apple belly just looks worse when I do. I wish you could help me with alternatives for that situation. When my belly is apple shaped, I wear a top that stops about mid-hip and leave it untucked. I’ve found that when I wear a long top trying to cover the tummy or the hips, it brings more attention to those areas, or it makes me look as if I am wearing a tent. Now that I no longer wear heels, I find long tops to be the wrong proportion for me. 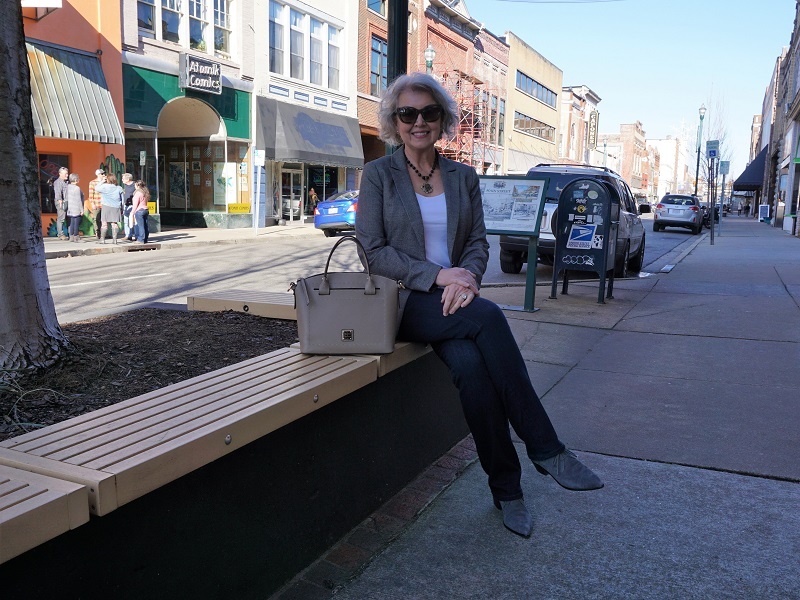 As a 62 year old woman, I have loved your blog. I’m no longer going to do or dress the way people say I should . I’ m still a sassy in shape happy woman. So I say goodbye to all the rules & will do what makes me happy ! I wish more women would think this way & stop following the so called experts!